Continuing the international theme, we are going to talk about Purchasing Power Parity today on MBA Mondays. I learned about purchasing power parity in business school and it has always helped think about international exchange rates. The theory is far from perfect and fails miserably in many situations, but I still think the basic construct of purchasing power parity is something everyone in business should understand. The basic concept is this: a basket of goods that are traded between markets should cost the same in different markets. My favorite example is the “Big Mac Index” which is calculated and published annually by The Economist. If a Big Mac costs $4 in the US and 3 pounds in the UK, then the proper exchange rate between the two currencies should be four dollars to three pounds which works out to be 1.33 dollars per pound. The reason I like the Big Mac index is it is simple to understand. 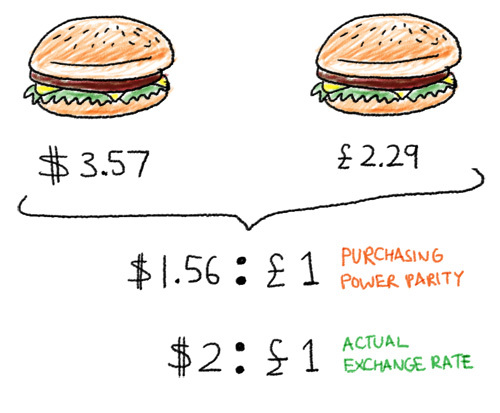 A Big Mac is not a “basket of goods” however and a more comprehensive basket of goods is normally used to calculate purchasing power parity of different countries. This is important to understand. If two baskets of goods should cost the same in different markets and they don’t, then the implication is that one currency is overvalued relative to another and that difference will eventually unwind itself. Let’s look at China versus the US. The International Monetary Fund (IMF) estimated in 2008 that one US dollar was worth 3.8 yuan using purchasing power parity. And yet the official exchange rate at that time was one dollar for 7 yuan. That situation has not changed much. The yuan dollar exchange rate is now one dollar of 6.8 yuan. What this means is that US made goods are more expensive in China than they should be using purchasing power parity as a guide. And Chinese goods are less expensive in the US than they should be using purchasing power parity as a guide. If the dollar yuan exchange rate was allowed to move entirely with market forces, the theory of purchasing power parity says that the exchange rate should move to around 4 yuan to the dollar. Until that happens, this price discrepancy will remain. There are all sorts of problems with purchasing power parity but I will not go into them here. The basic concept makes sense to me and is used widely in international economics. It is worth understanding as it provides a basic framework for how currencies can and should move relatively to each other. But, apart from that, not even the US government is arguing for a 4/1 RMB/USD exchange rate, which would mean much higher prices on a vast array of goods, and ultimately the inability to afford them for the average American. Not saying that the Rembimbi is not undervalued, but a massive devaluation of the US dollar would bring chaos and disrupt international trade. Letting it evaluate over the next few years looks like a more feasible policy. This article was originally written by Fred Wilson on July 12, 2010 here.